Summary: Western movie may be one of the movie genres you like. Here we list top 5 best western movies for your reference. You can also find the Blu-ray ripper tool to rip Netflix Blu-rays of western movies. Cowboys, revolvers, horses, sherrifs, gunfighting. Do these words remind you of something? Yeah, these 5 words are just words but they are actually depicting a movie genre. These words are referring to the Western Movies genre where you can see two cowboys walk away to a distance and then open gunfire on each other. Western Movies genre is liked by millions of people and Netflix didn’t resist including the Western Movies in its movie collection. In this article we are listing some of the top 5 best Western Movies on Netflix, Yee-haw. TheHateful Eight is a 2015 western genre movie starring Samuel L Jackson, Kurt Russell, and Jennifor Jason Leigh in main roles. The story is set in the Wyoming state of US in 1870s. A stagecoach moves to the Red Rock town with two passengers. Out of these two passengers one is John “Hangman” Ruth who is known to be a bounty hunter. The other passenger is known as Dasiy Domergue who is a wanted murderer and is the prisoner of John Ruth. On the way to their journey they meet two more bounty hunters known as Major Marquis Warren and Chris Mannix. Because of a heavy blizzard these people take refuge in a store which is already occupied by other stagecoach’s occupants. Soon suspicions begin to spark among them and the killing spree begins. A man who was presumed dead in a civil war comes back to the New Mexico city and opposes his sister’s plan to sell his family’s house to a mining company. The film stars Barlow Jacobs and Clare Bowen and is directed by Jared Moshe. It is one of the best western movies on Netflix. Starring Greg Evigan, Barry Van Dyke, and Sage Mears shows the story of a girl who with the help of a bounty hunter seeks revenge for her dead family. The girl learns gunfighting from the bounty hunter to avenge her family’s deaths. This is a nice movie with a simple story and lots of gun action. It is also one of the best western movies on Netflix streaming that you can stream anytime. The filmcirculates around two brothers and a drug lord. Armando’s brother Raul comes back to his family with his fiancée. Raul takes the task of fixing Armando’s financial problems. But soon things start to go wrong as Raul brother Armando falls in love with his fiancée Sonia. Armando and Sonia find out Raul’s illegal business. Raul’s troubles increase as the drug lord opens a war against him and his family. The film is full of war type action scenes and sequences. Though this movie is funny but it can be considered as one of the best western movies on Netflix. The story is set in the 1880s, and tells the story of a sharpshooter who has now turned to a rancher. Clay Travis is a married man with a son and a daughter. But his son dies and his daughter goes missing. Clay Travis leaves his ranch to bring back his daughter home safely. He goes to Dodge city and tracks down an evil brothel, LaVoie. His companion Billy helps him in destroying the henchman of LaVoie and to save his daughter. If you are renting Netflix Blu-ray discs then you may want to rip them and make a personal collection of western movies. Blu-ray ripping simply means converting the Blu-ray media to some other video or audio format and save it to a computer’s hdd. After ripping the Netflix Blu-ray western movies to a format like MP4 you can watch them on HDTV, PC, smartphones, and tablets. To rip a Netflix Blu-ray western movie disc you’ll need a powerful Blu-ray ripping softwareprogram. One such software is the DVDFab Blu-ray ripper. This Blu-ray ripper can be used to rip Netflix BDs to other audio and video formats and it fully supports 2D and 3D BD disc formats. You’ll be impressed by its number of output video formats to which you can rip your Netflix BDs to. It supports all major video formats like MP4, AVI, MKV, VOB, MP3, MP4 (4K) etc. DVDFab Blu-ray ripper can also permanently remove the Cinavia protection with the Blu-ray Cinavia removal solution(sold separately). Supporting multiple video formats doesn’t make a Blu-ray ripper worth using. DVDFab fully supports multi core CPU and GPU processing. It also supportsNVIDIA CUDA and Intel Quick Sync which speeds up the conversion process. As Blu-ray media is of very large sizes these three quick processing technologies will greatly reduce the ripping time. 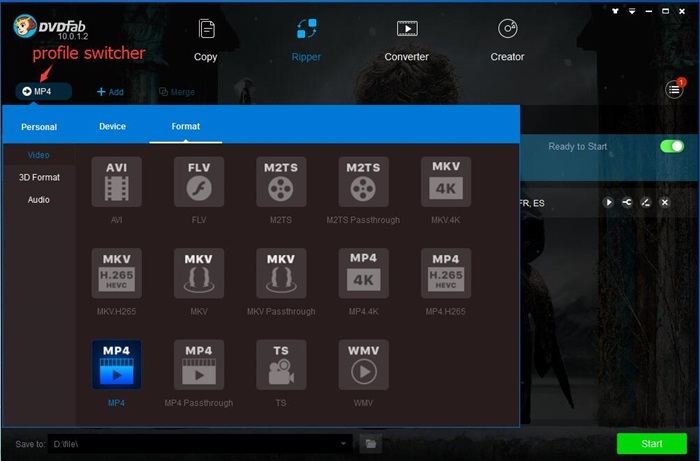 If you want a reliable Blu-ray ripper tool then check DVDFab Blu-ray ripper and give it a try for 30-days without paying any penny. During the 30-days trial period you can rip any number of Netflix Blu-ray western movies discs. This will surely let you know about all its features and performance metrics. Ripping the best western movies on Netflix becomes so easy with DVDFab Blu-ray ripper. All you need is rented Netflix BDs of western movies. This is currently the best tool to rip Netflix western movies. It is a paid software program though but you can always try it for 30-days. This much time is enough to make a right decision about this software.